The news earlier this month that Greeks, acting on fears the country might exit the euro, transferred 30 billion euros to foreign banks, many of them in Switzerland, would have left most people in the debt-ridden country perplexed. It is a year since Greece signed a deal with the European Union and the International Monetary Fund to receive a 110-billion-euro bailout to prevent bankruptcy. That agreement came with strict terms and over the last 12 months the government in Athens has imposed the kind of austerity measures that make it difficult for Greeks to imagine that some of their countrymen might have enough spare cash to deposit in Swiss bank accounts. One of the key features of the loan agreement has been repeated tax increases. Value added tax (VAT) has gone up several times since last year, income tax has been adjusted, duties on alcohol, fuel and tobacco products have been hiked and the tax on pensions has been increased. As a result, Greece now has the third-highest VAT rate in the EU, the second-highest duty on petrol and the third-highest social security contributions in the 27-nation bloc. Brussels – There’s a homeless man who sits with his back against the wall of Gare du Nord railway station in Brussels and begs for money. He chooses a spot near the station’s side exit, where few people pass. It also rains a lot in the Belgian capital, so he doesn’t look like a happy man. But by the end of Friday, when European Union leaders will have finished negotiating on new, stricter budget rules for member states just a couple of kilometers from where the beggar sits, they could make him look like the happiest guy in town. 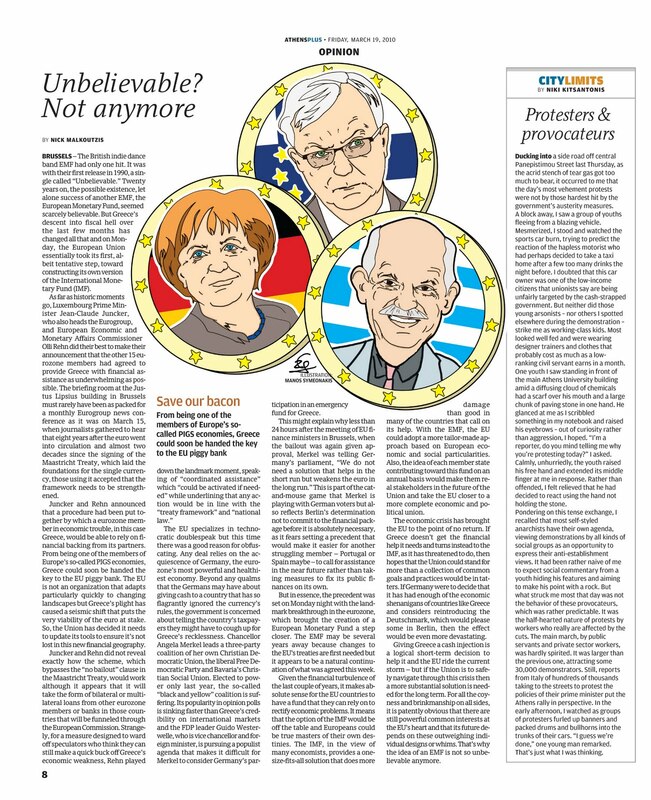 Such has been the intensity of disagreement over how to take economic governance up a notch in the 27-nation bloc that there will be a lot of fraught faces in Brussels this week. Of course, if a deal is reached, the smiles will break out – until people start questioning the implications of what has been agreed. The negotiations leading up to the summit, which began on Thursday, have been overshadowed by events on October 17: Just as a task force of EU finance ministers led by European Council President Herman Van Rompuy and assisted by the head of the European Central Bank, Jean-Claude Trichet, was putting the finishing touches to proposals designed to stop member states like Greece from overspending, Germany and France decided they would save everyone the trouble and decide on the final scheme on their behalf. The task force had come up with a system of issuing sanctions against countries that violate the 3 percent of gross domestic product (GDP) limit on their public deficits and the 60 percent of GDP limit on debt, as set out in the EU’s Stability and Growth Pact. Countries that fail to conform would face the prospect of being fined. 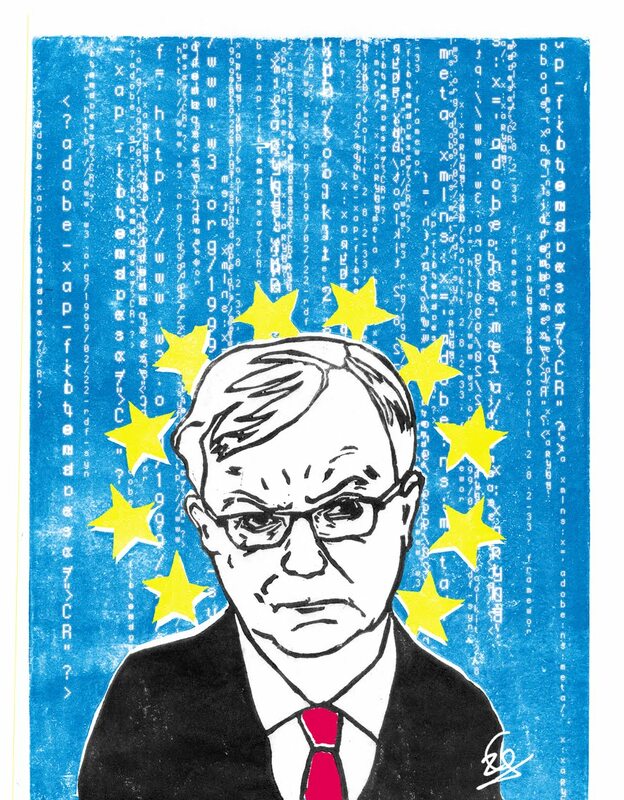 Both the ECB and the European Monetary Affairs Commissioner Olli Rehn had wanted this process to be semi-automatic, in other words not to be open to political interpretation or manipulation. Before the mechanism – which for now will only apply to countries that use the euro – was even properly conceived, German Chancellor Angela Merkel and French President Nicolas Sarkozy announced they had agreed on a different method. In a two-way compromise, Merkel agreed that a qualified majority of eurozone governments would be required to start disciplinary action (including political sanctions such as withdrawal of a state’s voting rights) and that a permanent emergency fund should be created for members that can’t balance their books, while Sarkozy conceded that any changes to budget rules should be included in an amended EU treaty. The Finn was speaking at the launch of a new system for monitoring the performance of eurozone economies. Dubbed the Euro Monitor 2010, the report compiled by the Lisbon Council think-tank and the Allianz financial services provider uses a range of 15 indicators in four key categories – fiscal sustainability; competitiveness and domestic demand; jobs, productivity and resource efficiency; and private and foreign debt – to evaluate performance rather than just fiscal measurements. The idea is that the Euro Monitor would provide a better early warning system of failing economies and would be a more comprehensive way of monitoring and encouraging balanced growth in the member states. Given that he’s had more numbers thrown at him this year than a bingo hall announcer, perhaps Rehn, who expressed his support for such an analytical tool, could be excused for missing the irony of the occasion. He may well favor a more rounded approach to assessing economic progress but the measures due to be approved this week use purely fiscal indicators as their totem poles. Even though the EU is more acutely aware of its failings thanks to Greece’s spectacular implosion, the Union is about to commit to a form of “reinforced economic governance” that is predicated on the same terms that have underpinned eurozone economies for the last decade and which failed to prevent the current mess in which many member states find themselves. It uses the same debt and deficit limits that were consistently violated, not only by rulebreaker Greece but by rulemakers France and Germany as well. Also, the proposed mechanism pounces on failure rather than encouraging success. It threatens to punish member states that fail to comply with somewhat arbitrary fiscal limits but does not suggest how they can drive their economies to stay clear of trouble. It proposes sanctions when there is no evidence that financial penalties bring states into line. Greece, for example, was the first EU country to ever be fined for an offense – for the operation of an illegal trash dump on Crete – in July 2000. It spent the following 10 years amassing fines for breaching EU environmental legislation. At the end of the decade, Greece still had one of the worst environmental records in the Union. It had neither reformed nor conformed as a result of the fines. There is a deeper problem, though, with the proposals. They show the EU to be running short of ideas at a most crucial juncture: When countries across Europe, from Greece to Britain and Ireland to Portugal, are taking the austerity hatchet to their troubled economies, there seems to be no attempt to develop a more sophisticated and nuanced economic model to deal with the challenges of the 21st century. Europe appears to have accepted the cost-cutting, tax-hiking philosophy of the International Monetary Fund without question. This undermines the Union much more than any disagreements or backroom politics. The EU was once about breaking through the waves; its budget proposals are only about staying afloat. The measures reek of bleakness and there is nothing there to inspire the Union’s 500 million inhabitants. As John Rentoul, a commentator for the British daily The Independent, wrote in the wake of his government’s drastic spending cuts: “This isn’t about economics – as ever, that can be argued either way – it is about a strategy for the country.” Or in this case, the Union, and there doesn’t seem to be one. Whatever is finally agreed this week, EU leaders will not be able to escape the fact that they are talking one language — that of debt, deficit, austerity, limits and sanctions – when many of their people would like to hear them speak another – that of jobs, security, prospects, fairness and quality of life. Even the homeless man in the street would be able to tell them that avoiding financial bankruptcy does not prevent you from being morally bankrupt, balancing your budget does not mean you have an equal society and reducing your deficit does not preclude you from being short of ideas. This commentary was written by Nick Malkoutzis and was published in Athens Plus on October 29, 2010. Brussels – The British indie dance band EMF had only one hit. It was with their first release in 1990, a single called “Unbelievable.” Twenty years on, the possible existence, let alone success of another EMF, the European Monetary Fund, seemed scarcely believable. But Greece’s descent into fiscal hell over the last few months has changed all that and on Monday the European Union essentially took its first, albeit tentative step, toward constructing its own version of the International Monetary Fund. As far as historic moments go, Luxembourg Prime Minister Jean-Claude Juncker, who also heads the Eurogroup, and European Economic and Monetary Affairs Commissioner Olli Rehn, did their best to make their announcement that the other 15 euozone members had agreed to provide Greece with financial assistance as underwhelming as possible. The briefing room at Justus Lipsius building in Brussels must rarely have been as packed for a monthly Eurogroup news conference as it was on March 15 when journalists gathered to hear that eight years after the euro went into circulation and almost two decades since the signing of the Maastricht Treaty that laid the foundations for the single currency, those using it accepted that the framework needs to be strengthened. Juncker and Rehn announced that a procedure had been put together by which a eurozone member in economic trouble, in this case Greece, would be able to rely on financial backing from its partners. From being one of the European members of the so-called PIGS economies, Greece could soon be handed the key to the EU piggy bank. The EU is not an organization that adapts particularly quickly to changing landscapes but Greece’s plight has caused a seismic shift that puts the very viability of the euro at stake. So, the Union has decided it needs to update its tools to ensure it’s not lost in this new financial geography. The EU specializes in technocratic double speak but this time there was a good reason for obfuscating. Any deal relies on the acquiescence of Germany, the eurozone’s most powerful and healthiest economy. Beyond any qualms that the Germans may have about giving cash to a country that has so flagrantly ignored the currency’s rules, the government is concerned about telling the country’s taxpayers they might have to cough up for Greece’s recklessness. Chancellor Angela Merkel leads a three-party coalition of her own Christian Democratic Union, the liberal Free Democratic Party and Bavaria’s Christian Social Union. Elected to power only last year, the so-called “black and yellow” coalition is suffering. Its popularity in opinion polls is sinking faster than Greece’s credibility on international markets and the FDP leader Guido Westerwelle, who is vice-chancellor and foreign minister is pursuing a populist agenda that makes it difficult for Merkel to consider Germany’s participation in an emergency fund for Greece. This might explain why less than 24 hours after the meeting of EU financial ministers in Brussels, when the bailout was again given approval, Merkel was telling Germany’s Parliament: “We do not need a solution that helps in the short run but weakens the euro in the long run.” This double talk is part of the cat-and-mouse game that Merkel is playing with German voters but also reflects Berlin’s determination not to commit to the financial package before it is absolutely necessary as it fears setting a precedent that would make it easier for another struggling member – Portugal or Spain maybe – to call for assistance in the near future rather than itself taking measures to fix its public finances. But in essence, the precedent was set on Monday night with the landmark breakthrough in the eurozone, which brought the creation of a European Monetary Fund a step closer. The EMF may be several years away because changes to the EU’s treaties are first needed but it appears to be a natural continuation of what was agreed this week. Given the financial turbulence of the last couple of years, it makes absolute sense for the EU countries to have a fund that they can rely on to rectify economic problems. It means that the option of the IMF would be off the table and Europeans could be true masters of their own destinies. The IMF, in the view of many economists, provides a one-size-fits-all solution that does more damage than good in many of the countries that call on its help. With the EMF, the EU could adopt a more tailor-made approach based on European economic and social particularities. Also, the idea of each member state contributing toward this fund on an annual basis would make them real stakeholders in the future of the Union and take the EU closer to a more complete economic and political union. The economic crisis has brought the EU to the point of no return. If Greece doesn’t get the financial help it needs and turns instead to the IMF, as it has threatened to do, then hopes that the Union could stand for more than a collection of common goals and practices would be in tatters. If Germany were to decide that it has had enough of the economic shenanigans of countries like Greece and considers reintroducing the Deutschmark, which would please some in Berlin, then the effect would be even more devastating. Giving Greece a cash injection is a logical short-term decision to help it and the EU ride the current storm but if the Union is to safely navigate through this crisis then a more substantial solution is needed for the long-term. For all the coyness and brinkmanship on all sides, it is patently obvious that there are still powerful common interests at the EU’s heart and that its future depends on these outweighing individual designs or whims. That’s why the idea of an EMF is not so unbelievable anymore. 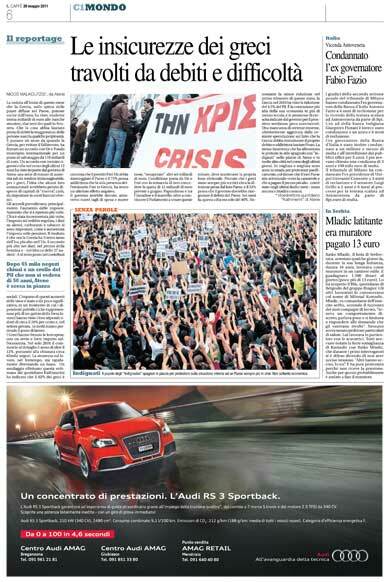 This commentary was written by Nick Malkoutzis and appeared in Athens Plus on March 19. When learning of the death of fellow writer Truman Capote in 1984, Gore Vidal’s response was blunt: “Good career move,” he said. 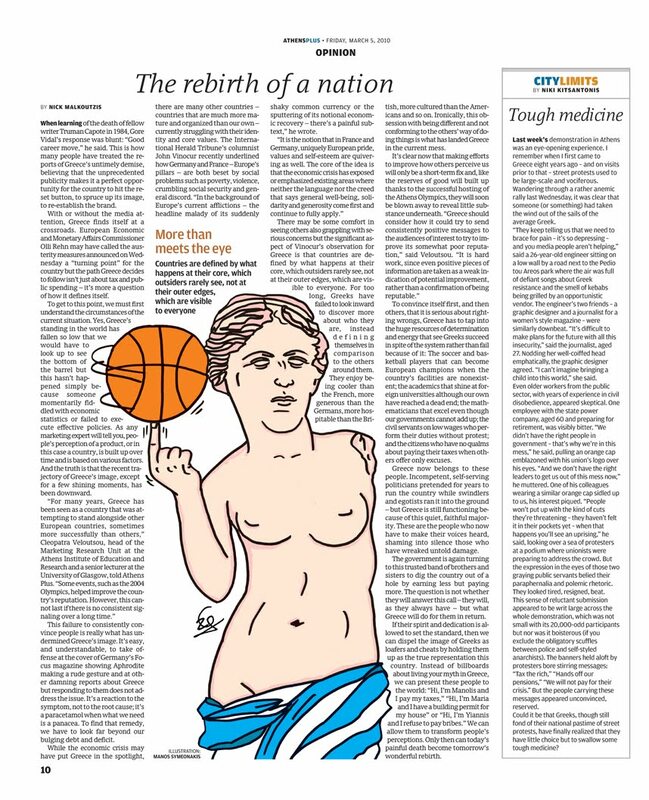 This is how many people have treated the reports of Greece’s untimely demise, believing that the unprecedented publicity makes it a perfect opportunity for the country to hit the reset button, to spruce up its image, to re-establish the brand. With or without the media attention, Greece finds itself at a crossroads. European Economic and Monetary Affairs Commissioner Olli Rehn may have called the austerity measures announced on Wednesday a “turning point” for the country but the path Greece decides to follow isn’t about just tax and public spending — it’s more a question of how it defines itself and what its values are. To get to this, we must first understand the circumstances of the current situation. Yes, Greece’s standing in the world has fallen so low that we would have to look up to see the bottom of the barrel, but this hasn’t happened simply because someone momentarily fiddled with economic statistics or failed to execute effective policies. As any marketing expert will tell you, people’s perception of a product, or in this case a country, is built up over time and is based on various factors. And the truth is that the recent trajectory of Greece’s image, except for a few shining moments, has been downward. This failure to consistently convince people is really what has undermined Greece’s image. It’s easy, and understandable, to take offense at the cover of Germany’s Focus magazine showing Aphrodite making a rude gesture and at other damning reports about Greece but responding to them does not address the issue. It’s a reaction to the symptom, not to the root cause; it’s a paracetamol when what we need is a panacea. To find that remedy, we have to look far beyond our bulging debt and deficit. While the economic crisis may have put Greece in the spotlight, there are many other countries – countries that are much more mature and organized than our own – currently struggling with their identity and core values. The International Herald Tribune’s columnist John Vinocur recently underlined how Germany and France – Europe’s pillars – are both beset by social problems such as poverty, violence, crumbling social security and general discord. “In the background of Europe’s current afflictions – the headline malady of its suddenly shaky common currency or the sputtering of its notional economic recovery – there’s a painful subtext,” he wrote. There may be some comfort in seeing others also grappling with serious concerns but the significant aspect of Vinocur’s observation for Greece is that countries are defined by what happens at their core, which outsiders rarely see, not at its outer edges, which are visible to everyone. For too long, Greeks have failed to look inward to discover more about who they are, instead defining themselves in comparison to the others around them and enjoying being cooler than the French, more generous than the Germans, more hospitable than the British, more cultured than the Americans and so on. Ironically, this obsession with being different to the others and not conforming to their way of doing things is what has landed Greece in the current mess. There is only one way to do this and that’s to tap into the huge resources of determination and energy that see Greeks succeed in spite of the system, rather than fail because of it: the soccer and basketball players that can become European champions when the country’s facilities are non-existent; the academics that shine at foreign universities although our own have reached a dead-end; the mathematicians that excel even though our governments cannot add up; the civil servants on low wages, who perform their duties without protest; and the citizens who have no qualms about paying their taxes when others offer only excuses. Greece now belongs to these people. Incompetent, self-serving politicians pretended for years to run the country while swindlers and egotists ran it into the ground — but Greece is still functioning because of this quiet, faithful majority. These are the people now have to make their voices heard, shaming into silence those who have wreaked untold damage. The government is again turning to this trusted band of brothers and sisters to dig the country out of a hole by earning less but paying more. The question is not whether they will answer this call – they will, as they always have – but what Greece will do for them in return. If their spirit and dedication is allowed to set the standard, then we can dispel the image of Greeks as loafers and cheats by holding them up as the true representation this country. Instead of billboards about living your myth in Greece, we can present these people to the world: “Hi, I’m Manolis and I pay my taxes,” “Hi, I’m Maria and I have a building permit for my house,” or “Hi, I’m Yiannis and I refuse to pay bribes.” We can allow them to transform people’s perceptions. Only then can today’s painful death become tomorrow’s wonderful rebirth. This commentary was written by Nick Malkoutzis and first appeared in Athens Plus on March 5, 2010.